It came as a surprise then, to analysts who were closely following the conflict to see in August 2013, a sarin gas attack in Damascus, on the same day UN inspectors arrived in the capital for the very purpose of investigating claims of previous chemical weapons use. Why would Damascus risk using chemical weapons when it was already winning the war soundly with more effective conventional weapons, especially under the nose of UN chemical weapon inspectors? Answering the question of “cui bono?” was simple – NATO, its regional partners, and their proxy terrorists – who would benefit immensely if they could convince the world that Syrian President Bashar al-Assad had “gassed his own people.” The Western propaganda machine was thrown into decisive motion. The UN immediately set out to investigate the attacks but were unable to draw any conclusions as to who the perpetrators were. Citing “evidence” Western intelligence agencies had “collected,” but would not divulge, the West attempted to convict the Syrian government entirely in the court of public opinion. Image: It was later confirmed that NATO-member Turkey was helping supply Al Qaeda terrorists with sarin nerve agent, as well as training in how to use it. The US and its partners failed categorically to produce any evidence linking the attacks to Damascus, and despite claims that the UN’s investigation “pointed to Assad,” the UN itself never determined the party responsible. 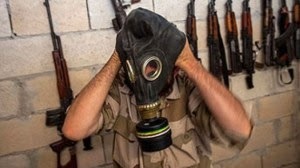 It wasn’t until a bombshell report by Pulitzer Prize-winning veteran journalist Seymour Hersh titled, “Whose Sarin?” that the truth behind the West’s lies were revealed – that NATO-member Turkey and close US ally Saudi Arabia gave Al Qaeda-Al Nusra terrorists training and equipment to carry out sarin attacks – and most likely carried out the August 2013 attack in an attempt to justify foreign intervention and save an otherwise lost battle against the Syrian government. Russia for months has continuously confounded NATO’s attempts to overthrow and reorder the nation of Ukraine along its western border. While NATO managed to violently remove the elected government of Viktor Yanukovych, the proxies it chose to replace it with were immediately as incompetent as they were unpopular. In quick succession, Crimea peeled away from Kiev and became a federal district of Russia, while the provinces of Donetsk and Lugansk declared independence and sought closer ties with neighboring Russia. 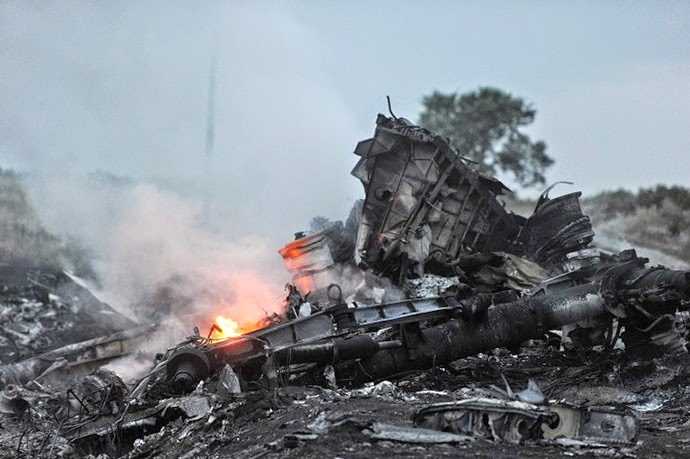 With Russia and the separatists in eastern Ukraine standing at the threshold of inevitable victory and standing high in global public opinion, Malaysia Airlines flight MH17 was downed near the Ukrainian-Russian border in territory controlled by eastern Ukrainian separatists. Again, answering the question of “cui bono?” is simple. NATO – and the West made no secret of this. The “game changer” indeed – just like NATO’s false flag sarin gas attack in Damascus was supposed to be at a time Syria’s government would benefit the least from it, and when NATO would have benefited the most. Again, absolutely no evidence is being provided for public scrutiny – the public is simply being told that it “exists,” just as it “did” in Syria’s case. The hysterical accusations being made by Western politicians and the media echoing them in editorial after editorial is behavior unbecoming of a global order that passes itself off as guided by the “rule of law,” “democracy,” “justice,” or just plain human decency. For now, all that is certain is that there’s a plane wreck in eastern Ukraine. That is all the evidence that exists. 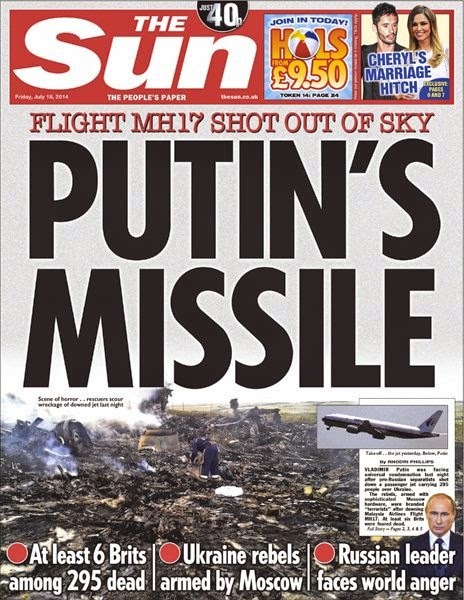 Clearly fabricated propaganda emanating from Kiev hints to criminal conspiracy aimed at framing Russia, but the particulars of how MH17 crashed and who may be responsible have yet to come to light. Image: The only evidence – a field with MH17’s wreckage. At best, commentators and analysts must search for what is most probable while calling for and awaiting the results of an independent investigation. Until then, no conclusions can be made, and certainly no measures taken based on such premature, baseless conclusions. Next, the psychological and political inertia the West is attempting to build against Russia must be blunted. The irresponsible preying on emotions and skewing of reality by the West and its propaganda endangers the search for truth – constituting an international obstruction of justice. We should not expect the West to search for credible evidence or provide it. Whatever independent investigation does take place, will be manipulated and spun by the Western media, drawing conclusions that were never made by investigators, just as was done in Damascus in August of 2013. Already, the West is claiming the crash site is being “tampered with” – a convenient excuse to dismiss unfavorable developments that implicate either NATO or Kiev, or both. As with the Damascus sarin gas attack in 2013, those seeking the truth must weather the propaganda firestorm, poking holes in the lies relentlessly until time has run out for those seeking to exploit this catastrophe. The West must not be allowed to reassert itself in Ukraine, a nation it destabilized with its engineered “Euromaidan” mobs and the subsequent, illegitimate regime that resulted in the first place. Readers must finally ask themselves what sort of “world leader” would celebrate the downing of a commercial airliner as a “game changer” and immediately mobilize, not to seek the truth, but exploit fully baseless accusations and intentional distortions to score political points in the immediate aftermath? A “world leader” we can afford allowing to continue leading?